Awakenings is a collection of poems written by Whitney McNulty with the hopes of promoting healing in others. Through her journey of loss, lust, faith, and struggle to a place of self-love, she dares to bring to awareness some of the trials and uncertainties experienced in young womanhood. With the potent use imagery, vibrant illustrations (by the talented Jackie Goneze & Shaylah Brown) and sprinkles of Scripture throughout, Awakenings invites you to delve deep into yourself, past any perception of darkness and find the light, as well as your voice. Whitney McNulty is an author, empowerment speaker & freedom coach on a mission to help you kickstart your dreams, activate your power and LIVE boldly in your purpose NOW. She specializes in workshop facilitation, mastering freedom in mind, body & soul and is known for fiercely pulling men & women out of their comfort zones. Her book of poetry, Awakenings is more than a literary work-- it is a call to action. Awakenings dares you to look beyond your own perception of darkness in order to live a healthier, more ABUNDANT life. 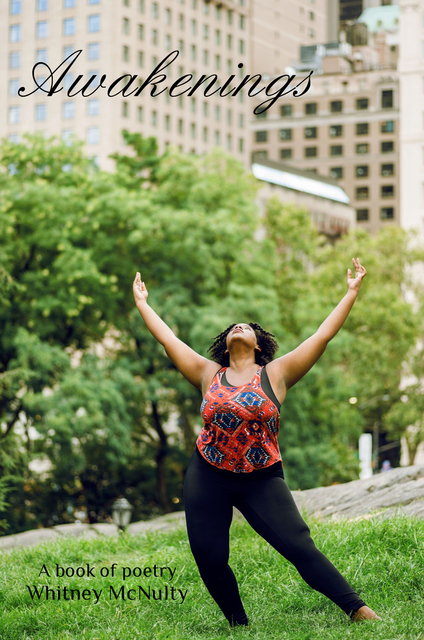 By sharing her story, she hopes to encourage others to actively seek self-acceptance, tend to their spiritual needs and choose not to just exist but THRIVE. Whitney is currently a dual youth ministry leader, holds a M.A. in General/Experimental Psychology, has training in Applied Behavior Analysis, is founder of the #WorshipWithWhit Liturgical Dance Class in NYC and Creative Director for MindfullyMOTIV8. Her second book of poetry, ALIVE will be out this summer 2018.